Though spring is technically mere days away, we are all under a blanket of thick, heavy and glistening snow here in Upstate New York. As I type this, snowflakes fall in intermittent clips of tiny ice shards and fat puffs that make tree limbs and shrubs appear covered in fluffy, soft ewe's fleece. 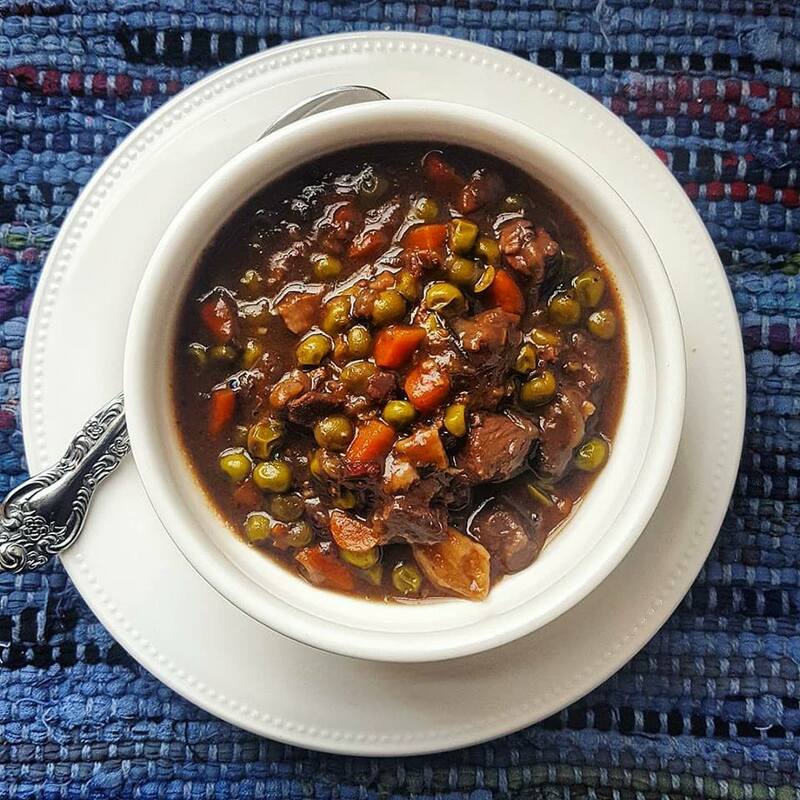 I'd much rather be prepping the garden for St. Patrick's Day pea planting, but instead, I'm embracing these (hopefully) last vestiges of winter by listening to Christmas music, plugging the twinkle lights back in, and making warming cold-weather dishes like boeuf bourguignon. This dish is a French classic and though it requires time, it's relatively hands-off. If time is an issue for you, skip the marinating period, jumping ahead to rendering the bacon lardons and add in onions and liquids in the measures provided for the marinade. In the picture here, I skipped the mushrooms and added carrots -- add, subtract or substitute on the veg as you wish. This is basically beef stew -- with wine! -- so go with what works in your kitchen. This recipe is just a starting point. Burgundy is the traditional wine that gives the dish its name, but I've found that a cheaper Beaujolais Nouveau works well, too. What foods are you cooking and baking to help you get through this extended winter? A tart-sweet summertime combination of rich indigo blueberries and green and maroon rhubarb -- we call it BLUBARB! Even on the hottest summer day, it's worth turning the oven on for. You will want to use the perfect pie dough recipe for your crust. Thanks to everyone listening in from WAMC today! It's always great to be on-air taking questions and talking food with Ray. This is my basic pie dough recipe, one that has been tested over, and over, and over again and used in recipes for stories and cooking classes. Dozens (hundreds?) of people have used this recipe and reported positive feedback, and I'm certain you'll have luck, too! Have a question? Leave a comment and I'll get back to you as soon as possible. Happy baking!